You know you have root weevils when you see these distinctive notches on your rhododendron leaves. Like slugs, root weevils are nocturnal creatures. To catch them chewing on your plants, you will have to go out at night with a flashlight. In fact, some gardeners do just that. They put on rubber gloves, grab a bucket and a flashlight, and go patroling the garden, picking weevils off their rhodies. Personally, I'm not a fan of picking bugs off of anything at any time of day. I'm also not a fan of using pesticides. So what are the alternatives? One, do nothing. Root weevils will not kill your rhododendrons. The worst that will happen is that you will have a lot of notched leaves. Two, do something to prevent the weevils from climbing up the branches of the plant. Root weevils can't fly. The only way they can reach the leaves is to walk up the branches. Try coating the base of the plant with something sticky like Tanglefoot. The weevils can't get past that sticky barrier and your leaves will be safe from harm. 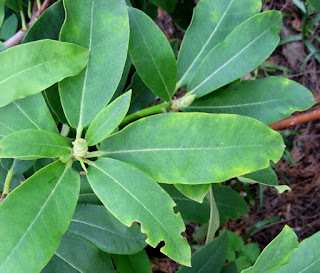 Three, plant rhododendrons that root weevils don't like. They won't bother any rhodie with fuzz, or indumentum, under the leaves, such as members of the Rh. yakushimanum family. Need more ideas on ways to de-bug your garden? Check out Eartheasy's article on natural garden pest control. The slugs are out in force right about now. You don't always see them, being the nocturnal creatures that they are. But the next morning, you certainly do see the damage done to the garden. If you are looking for a way to rid yourself of these pests without using toxic chemicals, consider installing beer traps in your garden. Slugs love beer! 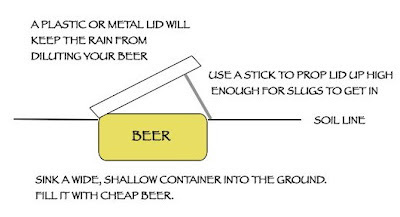 If you sink a container of beer into the ground so that slugs can crawl into it, they'll eagerly drown their sorrows, and themselves, in the brew. All you have to do is come by every day or so, scoop out the dead slugs and top up the beer supply. You probably have all the "equipment" you need for making traps in your kitchen right now. A glass jar, a large empty tuna can, a plastic margarine tub - any of these will make a fine trap. Next you'll want something to use for a lid, as shown in the drawing below, that will serve as an umbrella. Then dig holes and install the containers, sinking all but the top 1/4" into the ground. (Leaving a bit of a lip exposed at the top will keep rain from running into the trap.) 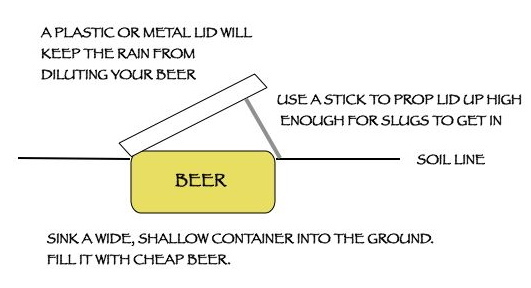 Now you're ready to add the beer - the cheaper the better - slugs aren't fussy. If plying slugs with alcohol doesn't appeal to you, there are many other non-toxic ways to protect your plants from slugs. Our friends at Eartheasy have a long list of effective methods, which feature, among other things: garlic, copper strips, seaweed, coffee, or adjusting your watering habits. Click here to read the article. Whatever method you choose, you'll be able to protect your garden without having to use toxic slug baits.